This float assembly fits ALL Desert Spring rotary disc furnace humidifiers ever produced including the DS3200, DS2001, DS2001C, DS2000, DS2000H. 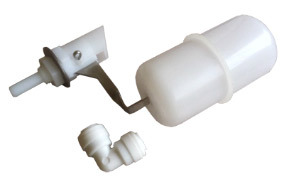 This is an original equipment replacement float assembly direct from Desert Spring Products Ltd. It may look different from your current float assembly as the manufacturer has updated the design, but it will fit.